We can work with a wide range of different video and image formats to produce the graphics, photos and videos we use for our production. Generally speaking, all our video is shot in high definition even if the end product is to be standard definition (DVD) or smaller. By starting with a high quality source and keeping it high through the development process and edit, when the end result is reduced to the size it is going to be shown, the quality will be the best it can be. If at a later date a higher resolution version is required then that quality is available without a re-edit. 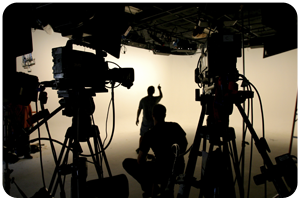 We use a range of video and photographic equipment from large Sony HDV cameras to small light cameras and top of the range DSLR cameras for both photography and video. We work on both Windows PCs and Apple Mac computers so are able to adapt our processes to work with existing material or provide the end media to members of your team regardless of the systems they use.